Frank Vincent Kiefer, along with his brother Joseph Augustus (Gus), formed the 'Kiralfo Brothers' juggling team that was one of the more popular and better known entertainment acts that worked the circus, vaudeville, burlesque, stage, spectacle show, fair, tent, out-of-door show and chautauqua circuits from 1888 until the team's retirement in 1929. Born in Mt. Vernon, Indiana in 1873, Frank moved with his family to the north side of Evansville, Indiana where the brothers would develop their act and practice their skills in the area known as Garvin Grove, now Garvin Park. Their practice sessions attracted area kids, who included a young Joe Cook, who would become a household name in American entertainment in the 1920's and 1930's. Evansville also was the hometown of jugglers Billy and Joe Ritzel and "The Wilsons". In 1890, after stints with the Terrell Brothers Circus and Wallace Shows. the brothers exited Evansville, Indiana to Whitewater, Minnesota to join The Kickapoo Medicine Show. For the next 40 years they worked the many circus, sideshow and vaudeville venues, including the Ringling Circus and the Sells_Floto_Circus - which was managed by circus icon Zack Terrell, whom most circus performers worked under at one time or another. Frank, known as "Major", and his brother Joseph,"Gus", performed a wide variety of acts: The Grotesque Terpischorean juggler; Grafula, in Thaumaturgical Excercises with Various Utensils; The Peerless Juggler Comique: The Classic Roman Juggler in Picturesque and Unique Excercises with Roman Implements of War; World's Greatest Battle Axe Men Comedians - Jugglers - Musicians - Dancers - Pantomimists - and Travesty Artists; Comedy Juggling - Rag Spinning - and Hat Dancing, Marvelous Cloth Twirler and Serio Comic juggler; Facial Artists - Gun Spinners and Hand Silhouettist; French Equilibristic Marvel; Sensational Drum Major; Refined and Novelty Comedy. Kiefer was sometimes billed as the "Chinese Comic Battle-Axe Juggler." Known for their profuse, colorful advertising posters and banners, the brothers guaranteed prospective audience members of: "No lamp tricks, no plate breaking, no cigar box comedy, no monotonous ball tossing...but a new departure in comedy juggling." They wore Viking-like costumes, including horned hats while dancing and juggling spears and swords. For their tours, they hired troupes of singers, dancers, amd musicians, and in their want ads they would offer, "good food" and "a low, but sure wage", while also warning, "cigarette fiends and boozefighters should save their stamps." Press clippings from every corner of the country showed the extensive travel of the brothers. They experienced the perils of travelling far and wide when their boat caught fire on the Missouri River and when they lost their wardrobe to a tornado at Chester, Illinois. In 1909, disgusted with perceived graft and corruption, Kiefer announced from the steps of the Evansville Court House that on August, 13th, he would embark on a two thousand mile walk from Evansville, Indiana to Seattle Washington, arriving on the October, 1st closing of the World Fair's Yukon and Alaska Exposition. 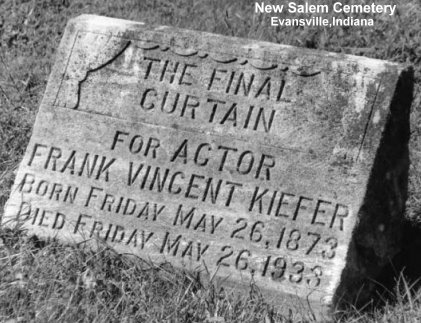 Along the way, Kiefer promised to reveal every form of "living-without-working" and make a speech at every town to show the benighted Americans that the "grafters have a grip on the land". He arrived in St. Louis on August 30th, and Chillicothe. Missouri, September 17th, ten days behind schedule, after only covering 300 miles. After the teams' retirement in 1929, the brothers moved a mile south of Cynthiana, Indiana where Frank, after years of paralysis, died on his sixtieth birthday, May 26, 1933. After Frank's death, Gus changed his stage name to "Grafula" and performed as "A Unique Circus Unit: Gus Kiralfo and his Aztec Diabolians of San Antonio, Texas". In the early 1940's Gus, lived on West Eichel Avenue, in Evansville and operated a school for tap dancers and novelty acts. Gus had plans to revive the troupe after the end of World War II, but was a victim of a hit-and-run driver, and died in San Antonio, TX on July 31, 1946. He is buried in San Antonio, Texas. 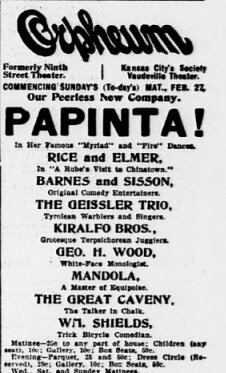 Note: Vaudeville theaters would perform as many as eight shows a day and an act's popularity was directly related to its position in the billing. The most popular acts were placed in the middle of the billing and the worst act was reserved for the final act to get the audience out of the theater quicker in order to prepare for the next show.